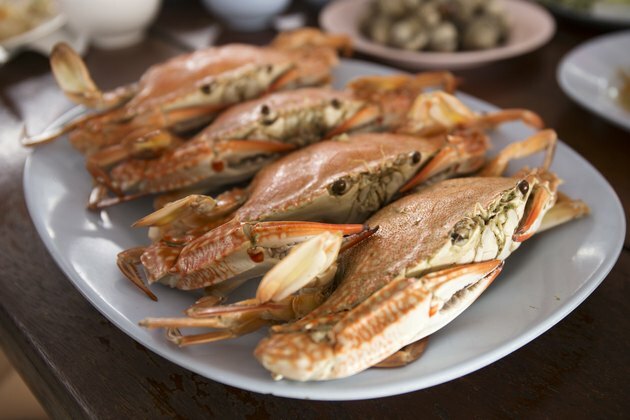 Dungeness crabs are a variety of crab that is found in the waters of the West Coast of North America. The name of the crab derives from the name of the city Dungeness, Washington. The crab is harvested using a variety of methods, including using nets and special-made crab pots. This crab is considered a delicacy, and there are very stringent regulations in place that must be followed before harvesting. While the best crab meat is fresh, frozen crab legs can be prepared in the same way as fresh. Thaw the crab legs in the refrigerator for at least 24 hours before cooking. Prepare a large pot of water by liberally salting the water. Bring the water to a rolling boil. Carefully plunge the crab legs into the boiling water. Add any seasoning you desire and place a lid on the pot. Cook the crab legs at a rolling boil for 12 minutes. Remove the lid and check for a red shaded shell. Remove the cooked crab legs from the pot and serve immediately for a hot dish or plunge into an ice bath for cold crab legs.